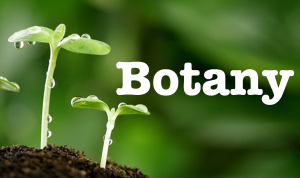 GATE 2019 Botany Syllabus has been Released. GATE 2019 is a national level exam organized by IIT Madras. The Engineering Graduation Skill Test (GATE) is organized for admission to PG courses in the field of engineering and technology, specifically ME / M.Tech. The exam will be held on 2nd, 3rd, 9th February and 10th February 2019. See here for complete information about the GATE 2019 Program. GATE 2019 Botany Syllabus has been Released. Click Here to Download Pdf. Major systems of classification, plant groups, phylogenetic relationships, and molecular systematics. Plant cell structure and its components; cell wall and membranes; organization, organelles, cytoskeleton, the anatomy of root, stem and leaves, floral parts, embryo, and young seedlings, meristems, vascular system, their ontogeny, structure and functions, secondary growth in plants and stellar organization. Cell cycle, cell division, the life cycle of an angiosperm, pollination, fertilization, embryogenesis, seed formation, seed storage proteins, seed dormancy, and germination. The concept of cellular totipotency, clonal propagation; organogenesis and somatic embryogenesis, artificial seed, somaclonal variation, secondary metabolism in plant cell culture, embryo culture, in vitro fertilization. Plant water relations, transport of minerals and solutes, stress physiology, stomatal physiology, signal transduction, N2 metabolism, photosynthesis, photorespiration; respiration, Flowering: photoperiodism and vernalization, biochemical mechanisms involved in flowering; molecular mechanism of senescence and aging, biosynthesis, mechanism of action and physiological effects of plant growth regulators, structure and function of biomolecules, (proteins, carbohydrates, lipids, nucleic acid), enzyme kinetics. Principles of Mendelian inheritance, linkage, recombination, genetic mapping; extrachromosomal inheritance; prokaryotic and eukaryotic genome organization, regulation of gene expression, gene mutation, and repair, chromosomal aberrations (numerical and structural), transposons. Principles, methods – selection, hybridization, heterosis; male sterility, genetic maps and molecular markers, sporophytic and gametophytic self incompatibility, haploidy, triploidy, somatic cell hybridization, marker-assisted selection, gene transfer methods viz. direct and vector-mediated, plastid transformation, transgenic plants and their application in agriculture, molecular pharming, plantibodies. A general account of economically and medicinally important plants- cereals, pulses, plants yielding fibers, timber, sugar, beverages, oils, rubber, pigments, dyes, gums, drugs and narcotics. The economic importance of algae, fungi, lichen, and bacteria. Nature and classification of plant diseases, diseases of important crops caused by fungi, bacteria, nematodes and viruses, and their control measures, the mechanism(s) of pathogenesis and resistance, molecular detection of pathogens; plant-microbe beneficial interactions. Ecosystems – types, dynamics, degradation, ecological succession; food chains and energy flow; vegetation types of the world, pollution and global warming, speciation, and extinction, conservation strategies, cryopreservation, phytoremediation. If you any query regarding GATE 2019 Botany Syllabus, you can ask your query leave comments below.